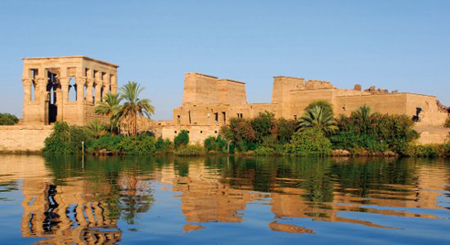 2 nights Cairo + 4 nights Lake Nasser Cruise + 3 nights Aswan + 1 night Cairo. Depart London Heathrow with the scheduled flight services of Egypt Air. Arrive in Cairo and transfer to your chosen hotel. Depending on arrival time, optional excursion to the atmospheric Sound and Light show at the Pyramids. Fly to Abu Simbel with the domestic flight service of Egypt Air. On arrival board the M.S. Eugenie. Lunch on board. Visit the Abu Simbel temples dedicated to Ramses II and his wife Nefertari, made all the more impressive by the fact that they were moved piece by piece during the building of the High Dam at Aswan. Optional excursion to the Sound & Light show at Abu Simbel temples. Candlelight dinner on board and overnight. Optional visit to watch the spectacular sunrise at Abu Simbel. Morning at leisure. Lunch will be served while sailing to Kasr Ibrim. Arrival at the citadel of Kasr Ibrim, the only monument on Lake Nasser to remain in its original location. (Tour is conducted from the ship's sundeck as entrance to the site is not permitted). Dinner and overnight on board. Sailing to Amada. Morning visit to the temples of Amada and Derr as well as the tomb of Penout, Viceroy of Nubia under Ramses VI. Afternoon visit to Wadi El Seboua, the Valley of the Lionesses, named after the avenue of Sphinxes, the temple of Dakka, and the temple of Meharakka. Dinner and overnight on board at Wadi El Seboua. Sail to Aswan and drink cocktails on board while crossing the Tropic of Cancer. Lunch served on board. Visit to Kalabsha temple, dedicated to Mandoulis, the Nubian version of the god Horus. Continue to the rockcut temple of Beit El Wali, and the kiosk of Kertassi erected in honour of Isis. Dinner and overnight on board in Aswan. After breakfast, disembarkation from the M.S. Eugenie and transfer to the Mövenpick Resort on Elephantine Island for the rest of your holiday. Elephantine Island is an idyllic island, set in the midst of the Nile. Perfect for those who just want to spend the rest of their holiday relaxing and enjoying the favourable climate, it is also a great base for exploring the surrounding areas. Choose to spend your days relaxing by the pool, admiring the stunning views over the city of Aswan, or continue with your sightseeing independently taking in the ancient temple of Khnum and the historic Nilometers on Elephantine Island itself. Take the hotel’s free shuttle boat service into Aswan to visit the ancient souk, one of the best outside Cairo to stock up on some souvenirs. Alternatively, take an optional excursion on a traditional felucca to sail around nearby Kitchener’s Island and visit the beautiful botanical gardens. Return with Egypt Air domestic flight to Cairo. Overnight in Cairo. Transfer to airport for return to UK on scheduled flight service of Egypt Air.